Well with Jimmy Schwartz there of course the next question was: what underlies this mechanism? And we began to explore that and we looked primarily at sensitization - heterosynaptic facilitation. We were able to show on a monosynaptic level this was changed by a strong input from the tail, stimulating single sensory neurons and recording from single motor neurons. And we wondered what was responsible for it. So one thing we said is we wondered whether this requires protein synthesis, because people were beginning to explore the role of protein synthesis in various kinds of processes. So we applied inhibitor of protein synthesis, and we saw no effect at all on these short-term memory processes, so that suggested it must be some short-lived messenger system. So we began to think, and I think Jimmy was one of the major proponents of this, that maybe this could be mediated by cyclic AMP, a second messenger system through which a number of transmitters worked. And so we began to dump several transmitter systems onto the abdominal ganglion, and we found that dopamine and serotonin increased levels of cyclic AMP. Of these, only serotonin produced sensitization. And then later we were able to identify neurons that actually released serotonin that mediated the sensitization; that was consistent with it. And then when Marcelo Brunelli came on board, we encouraged him to inject cyclic AMP into the sensory neuron. And he did, and he was able to reproduce the facilitation which also provided evidence that it's likely to have a very important presynaptic locus which Vincent was able to show with a quantal analysis. We then collaborated with Paul Greengard who was very much interested in cyclic AMP and who'd purified in the nervous system the cyclic AMP-dependent protein kinase, the enzyme through which cyclic AMP produces its action. And we could inject the catalytic subunit with the cyclic AMP-dependent protein kinase, and produce the facilitation, and we could inject an inhibitor of the cyclic AMP-dependent protein kinase and block the facilitation. So this was really very nice. We had the first insight into this, into cyclic AMP being important. And we were tremendously encouraged by this when within a couple of years people in Drosophila began to explore mechanisms of learning and memory in the fly. Seymour Benzer was doing, this in part, I think, stimulated by our work, and began to look at mutants [that were defective] in the learning they were looking at, and they found that the mutants interfered with the cyclic AMP-dependent protein kinase. So this was really very encouraging, that we were on the right track. So clearly the next step was to see whether we could see long-term memory, and try to explore that. And so Tom Carew came on board and he and Harry Pinsker explored both habituation and sensitization, and found that with repeated training, particularly spaced training, which was Tom Carew's idea, we were able to get long-term habituation and long-term sensitization lasting days, and we could show it in the monosynaptic connection between the sensory neurons and the motor neurons. Now again, as with Alden and my work on the hippocampus, and Irving in the behavioral work, I can't overemphasize the role of Harry Pinsker and particularly Tom Carew in the behavioral work. He brought to it an energy and understanding of the behavior - he had worked, I think, in mice before. So he and Irving had a very sophisticated understanding of behavior that was extremely helpful. And I really thought we were onto something. 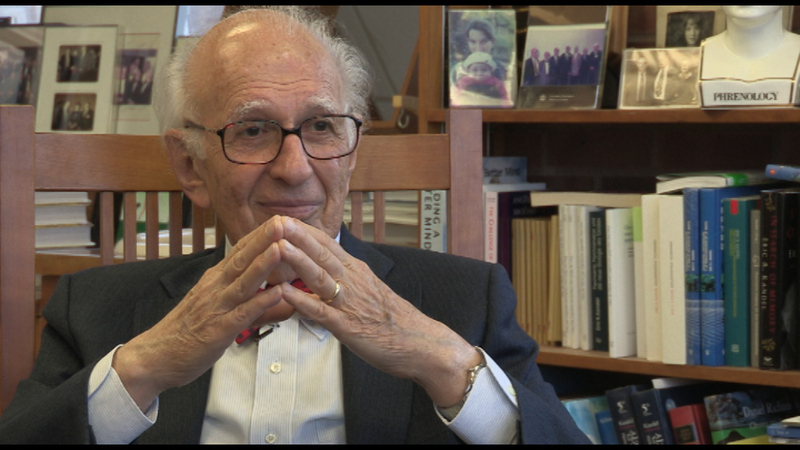 Eric Kandel (b. 1929) is an American neuropsychiatrist. He was a recipient of the 2000 Nobel Prize in Physiology or Medicine for his research on the physiological basis of memory storage in neurons. He shared the prize with Arvid Carlsson and Paul Greengard. Kandel, who had studied psychoanalysis, wanted to understand how memory works. His mentor, Harry Grundfest, said, 'If you want to understand the brain you're going to have to take a reductionist approach, one cell at a time.' Kandel then studied the neural system of the sea slug Aplysia californica, which has large nerve cells amenable to experimental manipulation and is a member of the simplest group of animals known to be capable of learning. Kandel is a professor of biochemistry and biophysics at the College of Physicians and Surgeons at Columbia University. He is also Senior Investigator in the Howard Hughes Medical Institute. He was the founding director of the Center for Neurobiology and Behavior, which is now the Department of Neuroscience at Columbia University. Kandel's popularized account chronicling his life and research, 'In Search of Memory: The Emergence of a New Science of Mind', was awarded the 2006 Los Angeles Times Book Award for Science and Technology.